Soon after landing off the coastal islands of Kalimdor, Aya's inquisitive nature in the study of magic lead her to the Night Elven druids of the close Northern coast. 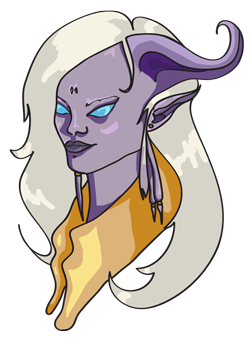 They launched her off to the Eastern Kingdoms soon after to aid in her understanding of other magic using races. Armed with only a few common phrases she soon landed herself a job as a noble houses arcanist. They embraced her, pushed her into a new cultural society and showed her the ways of those on Azeroth. Alongside the compulsory conscript to the Stormwind mage tower with her new role, understanding the way the Alliance utilized magic became clear to her. After the sudden arrest of the man of the household due to suspected dealings with The Dead Rose (assumed Legion supporters) Aya fled her role in the house and what came to be her home and family with disgust. Armed with a new determination to get as far away as possible from her previous Azerothian life, she has inherited the path of an exploring adventurer.